The Husky Framing Nailer is the ideal tool for your next framing, sheathing, remodelling or decking project. This framing nailer drives 20-22 degree Plastic Collated Full Round Head Framing nails from 2-inch - 3-1/2 in, in length. This tool is constructed of die-cast magnesium for lightweight usability on a variety of projects. The DPFR2190 is equipped with a select fire trigger to easily switch from sequential fire to bump fire mode, a tool-free depth adjust and removeable non-marring tip to protect your work surface. The 360 degree exhaust can be adjusted to direct the air flow away from your face and work area while the anti-dry fire mechanism prevents you from shooting blanks when the nail quantity is low. Simply load another strip of nails into the magazine and get back to work. We have included oil, adjustment wrenches, and a user manual. This tool is covered by Husky's 2 Year Limited Warranty. The Bostitch Stick Framing Nailer is the industry standard for wire weld framing nailers. It provides a lightweight, magnesium housing (weighing only 7.6 pounds) and touts 1050 In. Lbs. of driving power to tackle even the toughest engineered lumber applications. Its adjustable push-button depth guide sets nails to desired depths quickly and conveniently. The magazine can fit up to 100 nails that minimizes the need to reload. Additionally, it features a unique 16" layout indicator for achieving the correct distance between studs in a matter of seconds, without the interruption of a tape measure. The DEWALT DWF83WW framing nailer is built for high speed framing applications. New engine technology has been designed to reduce recoil and the nailers optimized centre of gravity results in a well-balanced tool. It is Fast, Light and Guaranteed Tough. The Grip-Rite Industrial GRTFR130 is designed for Pole barn Framing, Prefabricated houses, Timber Frames, Concrete Forms, Engineered Lumber, Export packaging, Pallets, Railroad timbers and other rugged industrial applications. This heavy duty nailer is built for durability and is equipped with an EZ-tool drive depth adjustment, a fast top loading magazine, dry fire lockout that increases tool life, durable molded rubber grip, an auxiliary handle to increase stability, and a bump fire trigger for maximum speed. The GRTFR130 has a magazine capacity of 54 nails. It shoots 21 degree Plastic Strip Round Head Framing Nails with a length from 2-1/2 in. to 5-1/8 in. long and a with a shank diameter from .148 in. to .165 in. thick. Also included with the purchase of this tool: auxiliary handle, safety glasses, hex wrenches, tool oil, parts manual, and male air plug. The convenient and powerful Hitachi Pneumatic 2 in. - 3-1/2 in. Wire Weld Collation Offset Round Head Framing Nailer offers a 360-degree adjustable exhaust, a dry fire lockout system and a non-slip grip for safe and efficient work. The nailer's anodized aluminum magazine holds up to 100 fasteners, and the open nose design enables easy clearing of jams. The nailer offers tough power for fastening engineered lumber either sequentially or with bump-firing action. 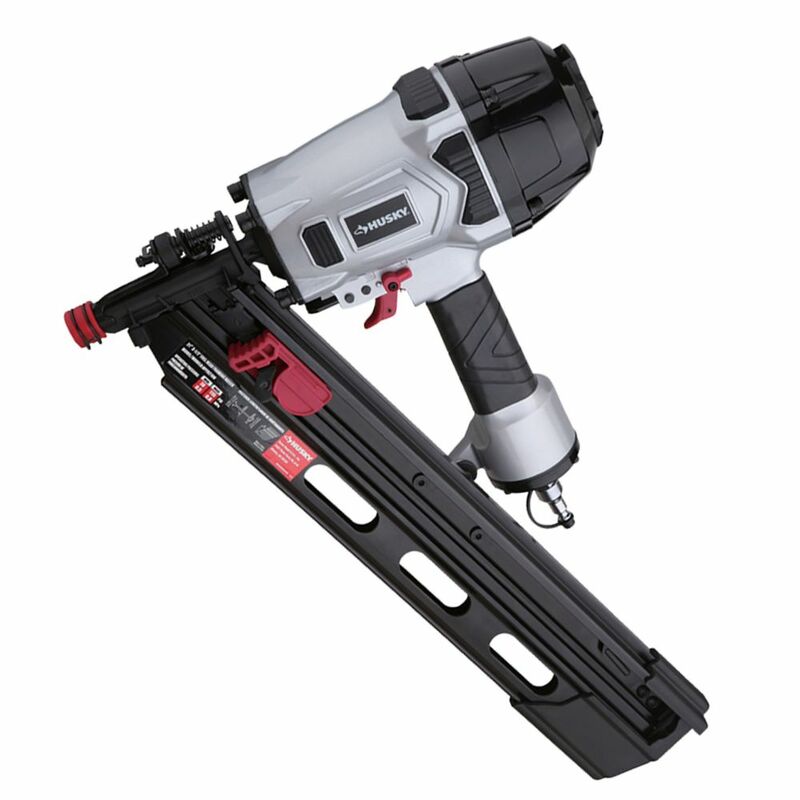 Pneumatic 3-1/2-inch 21-Degree Full-Head Strip Framing Nailer The Husky Framing Nailer is the ideal tool for your next framing, sheathing, remodelling or decking project. This framing nailer drives 20-22 degree Plastic Collated Full Round Head Framing nails from 2-inch - 3-1/2 in, in length. This tool is constructed of die-cast magnesium for lightweight usability on a variety of projects. The DPFR2190 is equipped with a select fire trigger to easily switch from sequential fire to bump fire mode, a tool-free depth adjust and removeable non-marring tip to protect your work surface. The 360 degree exhaust can be adjusted to direct the air flow away from your face and work area while the anti-dry fire mechanism prevents you from shooting blanks when the nail quantity is low. Simply load another strip of nails into the magazine and get back to work. We have included oil, adjustment wrenches, and a user manual. This tool is covered by Husky's 2 Year Limited Warranty. Pneumatic 3-1/2-inch 21-Degree Full-Head Strip Framing Nailer is rated 4.5 out of 5 by 150. Rated 3 out of 5 by William from spend more money and get something better,this is my 4th... spend more money and get something better,this is my 4th framing nailer,not the best. Rated 5 out of 5 by TopCop111 from Loaded some nails, put a few drops of oil in... Loaded some nails, put a few drops of oil in her, connected her to the compressor and BINGO. She works perfectly. I’m not a carpenter but I do Handy Man work and this tool helped me immensly on a bathroom remodel that I’m doing right now. Very Nice Tool at a great price! I only wish it had a bag. Rated 5 out of 5 by Jason from Good power, great for light framing as that is all... Good power, great for light framing as that is all I’ve used it for so far. Rated 5 out of 5 by James from Great value! Received quickly! Thank you!... Great value! Received quickly! Thank you! Rated 5 out of 5 by bugman from I have shot a couple of hundred nails through the nailer so far, and am happy with performance. I... I have shot a couple of hundred nails through the nailer so far, and am happy with performance. It drives 3 1/2 nails and 2 inch nails well. The depth setting on the nailer is easy to adjust. The nailer is lighter than I expected, and is easy to place the nail properly without getting my arm too tired. Very satisfied with the nailer. Rated 4 out of 5 by Chris from Seems like a good, budget nailer. I've put through... Seems like a good, budget nailer. I've put through about 500 nails with no issues. Air pressure is critical, of course, and it took a minute or two to dial it in to be able to sink nails properly. The plastic nail retention clip is likely the weak link and I don't think it will hold up over the years. Otherwise, it seems solid and it just works. Rated 3 out of 5 by HuskyNailGun from I have a 3 gallon compressor running the nail gun.... I have a 3 gallon compressor running the nail gun. After driving 6 to 8 three inch nails, the compressor motor has to kick on to repressurize the tank. This nail gun works well, but does use a lot of compressed air for just a few nails. What are the recommended Framing nails that you supply that are compatible with this unit? It states in the manual that it is compatible with all plastic Collared 21 degree framing nails.